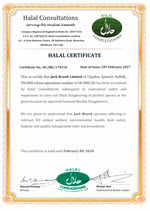 Products from Jack Brand Ltd are suitable for both Muslim and non-Muslim consumers. The status of Halal is validated by Halal Consultations Limited ("HCL"). HCL ensure compliance with Islamic slaughtering rules by inspecting the slaughtering process at regular intervals.